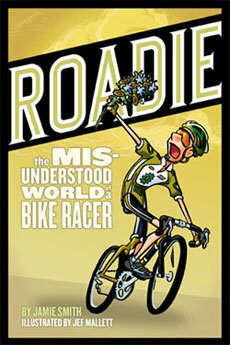 Jamie Smith's blog devoted to roadies, road cycling, and other stuff like surfing, golf, life, and sometimes his books. Finally, we have the perfect video to show what it's like to race in the Pro-1-2 field. The video begins with the nervous wait on the starting line. @:26 Riders ready? Go! The adventure begins. Hold on tight. @1:57 The inevitable happens; the rider gets dropped in explosive fashion. Oxygen is scarce as he rides around in circles for the next 5 minutes. He knows he'll never see the pack again. @6:48 At this point, just over 6 minutes into the race, the officials pull him off the course. @7:14 Here, you can see that the rider has thrown his helmet at his car as he approaches. @7:21 The rider arrives at his car. He then sits and stews in silence for a few minutes. @7:50 He is not alone. Far off in the distance, you can see another rider returning to his car. I'll take the turquoise one.